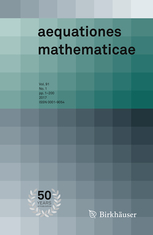 A new paper by Sandro Mattarei (University of Lincoln) and Marina Avitabile (University of Milano Bicocca) has been accepted for publication in Aequationes Mathematicae. Crucial progress on the paper was made during a one-month stay of Sandro as Visiting Professor at the University of Milano Bicocca in April 2017. Abstract: We introduce a generalization of the truncated logarithm in prime characteristic , which depends on a parameter . The main motivation of this study is being an inverse, in an appropriate sense, of a parametrized generalization of the truncated exponential given by certain Laguerre polynomials. Such Laguerre polynomials play a role in a grading switching technique for non-associative algebras, previously developed by the authors, because they satisfy a weak analogue of the functional equation of the exponential series. We also investigate functional equations satisfied by motivated by known functional equations for . This entry was posted on July 23, 2018 by Sandro Mattarei in New publications, News and announcements, research.